You are here: Home / Dogs / Platelet Enhancement Therapy – it’s a Cracker! Platelet Enhancement Therapy – it’s a Cracker! At Withy Grove we have started using Platelet Enhancement Therapy (V-PET) to help dogs with painful joints and ligaments. This therapy has been used all over the world but is now becoming more popular. 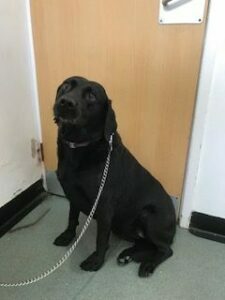 Our first patient was Cracker, a Labrador with sore arthritic elbows, wrists and toes. She had had various pain killers but we were struggling so our vet, Suanne, decided to give V-PET a go. Cracker waiting for the exit door to be opened at the surgery. 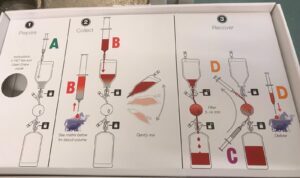 We take a small sample of your pet’s own blood and filter out and concentrate the platelets from it. Then we re inject these platelets back into the sore joint or area. The platelets are activated at the site of the injury, releasing the growth factors which then accelerate healing, regenerating tissue and helping new blood supply to come in too. The whole procedure is done on one day so your pet doesn’t have to come back. We usually use our therapeutic laser at the same time to further stimulate the body’s reaction. The blood sample drawn up. The sample being filtered before being injected back into the dog. We have only done a small number of dogs but the results have been excellent with increased mobility and significant pain reduction in all the cases. The idea is to get your dog off medication but it can be used alongside conventional medicines and supplements too. We also have an in house Physiotherapist who can help your pet with exercises. 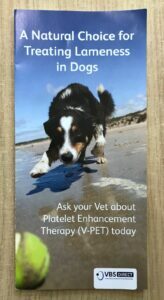 Ask us about Platelet Enhancement Therapy or pop in to pick up a leaflet – a natural choice for treating lameness in dogs! https://www.withygrovevets.co.uk/wp-content/uploads/2018/05/IMG-20180420-WA0001.jpg 950 1600 Michael Clarke https://www.withygrovevets.co.uk/wp-content/uploads/2019/04/Withy-Grove-logo2.png Michael Clarke2018-05-03 07:53:042018-06-06 07:28:28Platelet Enhancement Therapy - it's a Cracker! Hamilton has an F1 Fracture Does your cat have High Blood Pressure?